Your Dentist in Weatherford Says Boost Your Child’s Oral Health! February has been set aside as National Children’s Dental Health Month. As part of a coordinated effort, dentists around the country have joined forces to better educate parents on ways to improve their children’s oral health. 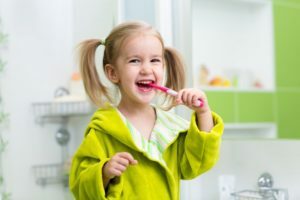 Read on as your dentist in Weatherford discusses the common oral health issues facing children and the best preventive care methods available. According to statistics, the biggest challenge for children’s oral health is cavity development. Cavities are brought on by bacteria that have been allowed to accumulate over time, which form plaque – a clear, sticky substance that clings to teeth and eventually bores holes in the enamel (the exterior, protective layer). It’s dangerous to ignore cavity development because it can lead to the greater issue of gum disease, which is also a growing condition among children. Along with causing tooth decay, the plaque can seep beneath the gumline and cause tenderness, red or pink spots, unpleasant breath or gums that bleed easily. Make toothbrushing a priority, and encourage your child to do so in the morning and before retiring for bed. Encourage two-minute dental hygiene sessions to ensure the teeth are cleaned properly. Consider having your child’s permanent teeth coated with a protective dental sealant as soon as they emerge. Encourage your child to drink plenty of water to help to flush his or her mouth and prevent the growth of bacteria. Also, don’t forget that in the fight for excellent oral health for your little one, your pediatric dentist is your ally. Thus, you should be sure to schedule a visit every six months for preventive care. Then, if there are any developing issues, they can be addressed before they mushroom into greater challenges. Through a united effort, this can become the best year ever for your child’s oral health! Dr. Deborah Romack is a graduate of Baylor College of Dentistry, and for over 20 years, she’s provided comprehensive care to her patients. Throughout her career, she has taken over 1,000 hours of continuing education, which allows her to treat patients of all ages. Dr. Romack helps parents and children experience the best in oral health at Cosmetic and Family Dentistry, and she can be reached for more information through her website. by: Dr. Deborah Romack at February 6, 2019 . Comments Off on Your Dentist in Weatherford Says Boost Your Child’s Oral Health!